Leather traditionally means luxury. It ought to be durable, and the patina of well-loved leather adds to its attractiveness. Unfortunately, not all leather is created equal. Your leather sofa, car seats, or shoes might not be aging as well as you had hoped. We’ll explain why your leather products might be peeling, and we’ll even give you some tips on how to combat the issue. As long as you’re taking the proper steps and using the right products to care for it, real, high-quality leather shouldn’t peel at all. However, many leather products aren’t actually 100% genuine leather despite what the label might say. If your leather is peeling it’s almost definitely because it’s a bonded substance, with some sort of synthetic coating on the surface. “Bonded” leather is a manufactured upholstery material that contains animal hide. Basically, they take scraps of real leather, grind it to a pulp and then glue it together. Due more to lobbyists than hobbyists, there are no regulations in place around how much leather (or what type) needs to be present to qualify for the “Genuine Leather” tag on imported goods. Unfortunately, many people purchase leather goods thinking it’s real but in reality, it’s a bonded material. Eventually, these products begin to crack and peel. This peeling and flaking are unsightly and sadly, there are no real ways to deal with it effectively. There are a few solutions on the market, however. Read on for our thoughts on each. Are There Ways to Fix or Restore Leather? Of course, there are! You just need to temper your expectations. Read online reviews and look for before and after shots to get an idea of what a typical outcome looks like before deciding on any restoration project. There are plenty of vinyl and leather repair kits out there. Each is a little different, but the point is that these kits allow you to dye the peeling sections and seal it so it doesn’t continue to flake. This may require additional applications over time (like every 6 months to a year), but it’ll take care of the job. If the flaking area is wide you are probably past the point of no return when it comes to a kit solution. But for the dedicated DIY’er there are other options. YouTube is a great start when it comes to getting ideas to fix peeling leather. There are several videos that will show you how to fix your leather (or bonded leather) furniture when it starts peeling. These creative people have gotten some really great results, usually by scraping or sanding down the peeled areas. Some people also paint the furniture afterward. Here’s a tutorial on scraping and sanding the peeled surface, and this video shows how to fix a peeled area using paint. If you are not naturally crafty, caveat emptor on any DIY solution. 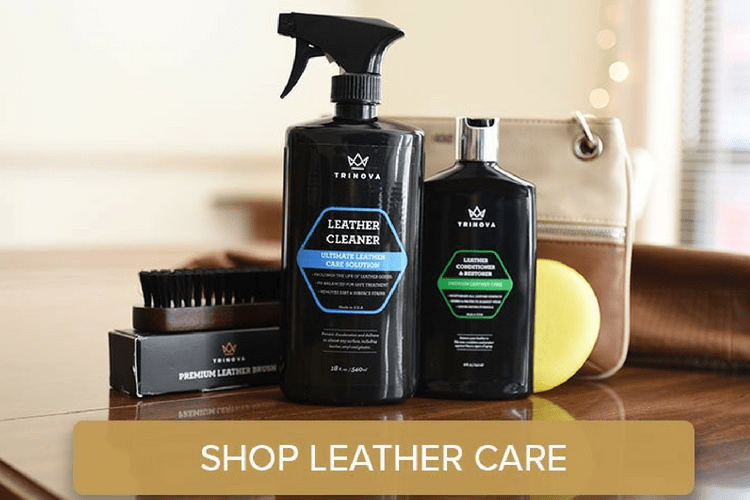 At Trinova, we’re here to meet all your leather care needs. We offer cleaners and conditioners for both faux leather and real leather – but remember, with an imitation surface breakdown is expected. No amount of care or prevention will sustain a faux surface. You’re paying substantially less, so just enjoy it, care for it within reason, and then replace when its life cycle is at an end. Do you have any tricks or DIY solutions to fix your peeling “leather”? Tell us in the comments below! Love to try.I’m not sure on what to use on leather couch or what % it is because I bought it used but it in good shape. Curious to how this leather care would work on, say, a leather iPhone case. It should work fine. I would remove the case before applying any cleaner and/or conditioner. Also, make sure the case if fully dried before putting it on your phone. The leather conditioner takes about an hour to dry.